Before he made a splash (and billions of dollars) with the first three Pirates of the Caribbean movies, director Gore Verbinksi made a modestly budgeted comedy called Mouse Hunt. 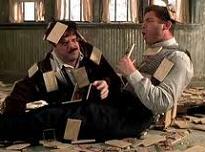 A witty, anarchic farce, the film (the first from then fledgling studio Dreamworks) stars Nathan Lane and Lee Evans as two brothers who inherit a dilapidated house after the death of their father. The only thing impeding their efforts to sell it is a plucky little mouse, who's determined to stay right where he is. The movie is effectively a live action Looney Toons cartoon and uproariously entertaining with it, packing in a lot of laughs and a surprising amount of charm under the mock Gothic façade. There's even a hysterical cameo from Christopher Walken as a bizarre pest control expert who gets his comeuppance at the paws of the four legged menace. The film was also Verbinski's first collaboration with composer Alan Silvestri. They would later reunite in 2001 on the Western parody The Mexican but parted ways during the turbulent post-production on the first Pirates of the Caribbean. Silvestri is one of the most chameleonic of film composers, jumping between action, thriller and fantasy but he's also most adept at comedy, having composed the likes of Death Becomes Her (with its macabre string ensemble) and Soapdish (with its kitschy Latino vibe). It's a deceptively tricky genre to compose for: the music must underline the humour without ever getting in the way of it but Silvestri has a particular knack (Marc Shaiman is another of his contemporaries who has much success in the genre). 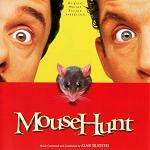 Mouse Hunt is undoubtedly one of Silvestri's most accomplished comedy efforts, and indeed one of the best overall comedy scores of the 90s, generating a sense of humorous momentum without ever becoming irritating. It's a tightrope Silvestri walks with real skill, placing special emphasis on specific instrumental components within the orchestra to lend the music a quirky edge. In particular, the score gives an oft-ignored instrument a chance to shine: the bassoon, whose low, infectious tones scamper about the score in the same way the mouse does on-screen. The bassoon leads the way in "Main Title", scurrying about above a mass of jumpy strings, and exquisitely reflecting the movements of the tiny rodent at the heart of the story. It's one of Silvestri's most ingratiating and entertaining title pieces. "Funeral Prologue" (which actually opens the film) continues in exuberant form, with a wonderfully over the top organ section in the manner of classic horror scores, Silvestri emphasising the comic darkness at work within the movie but just stopping short of serious menace. From here, the composer whisks the listener through a variety of styles. The old-school swing jazz of "Chez Ernie" is irresistible, as is the tender secondary theme teased out on solo violin in "Dying Wish" (suggesting the inevitable connection that will occur between mouse and human). This piece is then reprised as a lovely, stately waltz in "Charles Lyle Larue" and sandwiched in-between the delightful bassoon theme for the mouse in "What Are You Doing" (the latter also reprises the brothers' theme as a whistle). "Nail Gun" briefly shatters the good humour with a blast of familiar Silvestri action, brass ostinatos and xylophones going full bore as the mouse's home is invaded; this is then cleverly juxtaposed with the lounge jazz representing the careless human invaders. Silvestri's loyalty to his central themes keeps the score afloat, ensuring that it never runs adrift in a sea of aimless ideas. The likes of "Hot Tuboggan", "Cherry Catapult", the brilliant "Caesar's Big Drag" and "Shotgun Chase" place the mouse theme in an action setting, frequently reaching thrilling, rambunctious heights. When things calm down, the terrific bassoon writing once again stands out, darting and weaving throughout the fabric of the score. Even the more conventional cues such as "Ernie finds the Contract" bring new ideas to the table – the latter features an over-the-top, heroic snare drum melody. "Silent Movie" is, as the title suggests, a wonderful, violin-led pastiche to the golden age of cinema. "Insufficient Postage" re-introduces the jazz, this time with tapping bongos and a greater sense of florid style. In "Flaming Doo", Silvestri re-orchestrates the mouse theme, transferring it from the bassoon to the full orchestra and coming up with a thunderous action piece complete with loud brass and crashing cymbals. 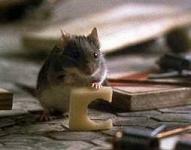 "String Cheese" then ends the score on a triumphant note, allowing the "Dying Wish" theme to rise to melodramatic heights before the "End Credits" round up the principal ideas in the score, including the infectious mouse theme. The brothers' theme also gets a wonderfully positive rendition on full strings, as well as the beautiful "Dying Wish" piece. Silvestri's score for Mouse Hunt is a mere 30 minutes long, half the length of your standard score release, but it packs in enough variety for several of them. It's a thoroughly charming and imaginative effort, working its way through a variety of styles but always anchored by its three central themes. Silvestri's sense of humour is a breath of fresh air, and showcases a side to the composer that's often lost in the brouhaha over louder efforts such as Van Helsing. It's efforts like Mouse Hunt which really demonstrate the composer's skill: he's able to invest a mainstream comedy with a brilliant sense of spiky wit, but never becoming so demonstrative that the music becomes annoying. Those who have been wary of comedy scores in the past would do well to start here. It's a fabulous score, one of the composer's very best. The score is available as both a CD release and MP3 download at these links Amazon.co.uk and Amazon.com.